View More In Seasonal Lighting - Page 2. These C9 LED replacement bulbs give your holiday lighting an instant glow by creating your childhood dream. 10 times more energy efficient than incandescent bulbs makes lighting up your holidays, easy on the budget! The bulbs are packed in quantities of 25 making them an economical choice. CSA listed, CE certified, and UL listed for indoor and outdoor use. 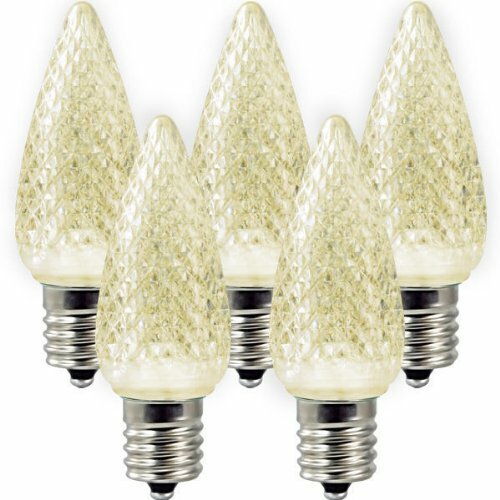 Create that warm holiday feeling when you paint your home or office with a lighting design featuring these bulbs. Note: These bulbs are designed to point out and will provide a much brighter look then if you place them up like a candle. LED's do not "glow" like a traditional bulb but with our designed faceted bulbs, you will get a more traditional glow. NEWER, BRIGHTER, ENERGY EFFICIENT. With 3 LED's per bulb emitting 0.58W of light, our new bulbs are more than 90% more energy efficient than incandescent bulbs. If you have any questions about this product by Holiday Lighting Outlet, contact us by completing and submitting the form below. If you are looking for a specif part number, please include it with your message.